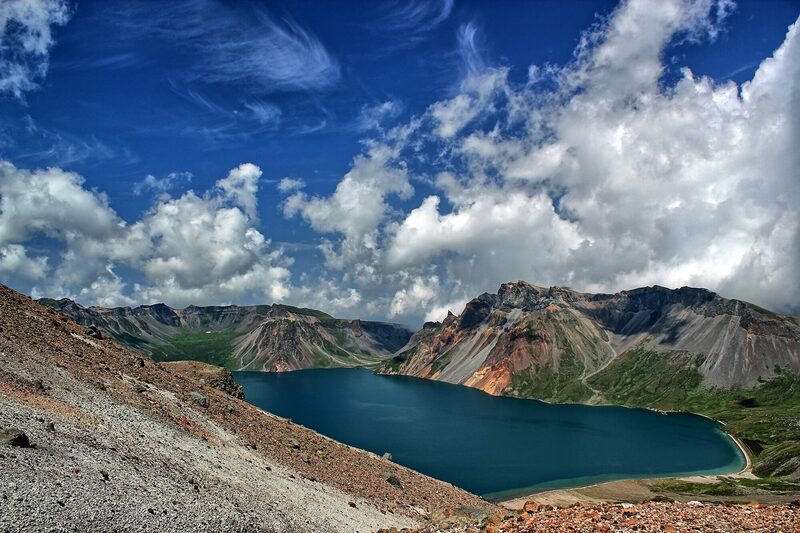 Mount Paektu, Baekdu, or Changbai is an active volcano on the border between North Korea and China. At 2,744 m (9,003 ft), it is the highest mountain of the Changbai and Baekdudaegan ranges. It is also the highest mountain on the Korean Peninsula and in Northeast China. Formed by a huge volcanic eruption, a large crater lake, called Heaven Lake is in the caldera atop the mountain. The 940-1000 AD eruption of Baektu Mountain has been dubbed the "Millennium eruption" or the "Tianchi eruption", and erupted about 100–120 km3 tephra. This eruption was about a Volcanic explosivity index (VEI) of 7. This was one of the largest and most violent eruptions in the last 5000 years (alongside the Hatepe eruption of Lake Taupo at around 180 AD and the 1815 eruption of Tambora). The modern names of the mountain in Chinese and Korean come from the Sushen or Proto-Jurchen language of the Manchu peoples. Its modern Manchu name is Golmin Šanggiyan Alin or Long/Ever White Mountain. Similarly, its Mongolian name is Ondor Tsagaan Aula, the Lofty White Mountain.